Dreamworks Animation have long been a hit or miss studio - for every exceptional film they produce, they can produce a fair few shallow stinkers. 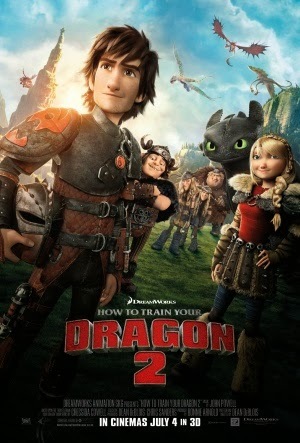 In 2010, they were often compared to the standards of acclaimed competitor Pixar with their adaptation of How to Train Your Dragon - emotionally resonant and beautifully animated, it stood tall as one of their most adored films and so a sequel was inevitable; it's been a shocking disappointment at the US box office, but that really doesn't reflect on its quality whatsoever. How to Train Your Dragon 2 picks up five years after the original; Berk has never been better since dragons became loyal pets, and Hiccup (Jay Baruchel) and Toothless never let their curiosity die; soaring off regularly to discover new places and new cultures. Their path crosses with dragon trainer Valka (Cate Blanchett), whose bond to Hiccup is a lot stronger then he may think, and who must work with him to stop Drago Bludvist (Djimon Hounsou) and his plans to conquer the lands with dragons at his command. It goes without saying that this sequel is even more beautifully animated than its predecessor, and the visuals truly flourish when viewed in IMAX 3D - even the dying depth inducing effect provides some spectacle during the films set pieces. Such stunning animation is what we've come to expect from DreamWorks after so many years in the business, and it's all supported with an equally fantastic score by the ever amazing John Powell. It's not as fine as Powell's work in 2010 but remains epic and grand, and Icelandic singer Jónsi returns with Where No One Goes, another hit song that will have everyone rushing to iTunes the minute the film ends. With dragons and vikings having made peace, a new world opens up for the main characters and the potential is fantastically captured by writer/director Dean DeBlois. What's presented is a unique plot full of its own surprises and twists that takes full advantage of the exciting new premise and focuses on advancing the future of the ongoing story arch. Perhaps what weakens this all for me is that there's too many flashbacks to elaborate lazily on necessary backstory and sometimes shocking moments don't always yield the visceral power they deserve. I also walked away from the film totally forgetting about the villain; generic and flat, he equates to nothing more than a beefy stock foe with little to no interesting characteristics, easily making him the films weakest attribute. With criticisms like that aside, this film still manages to provide a worthy narrative to succeed the original, full of top notch voice acting, great characters and a wonderful sense of humour.